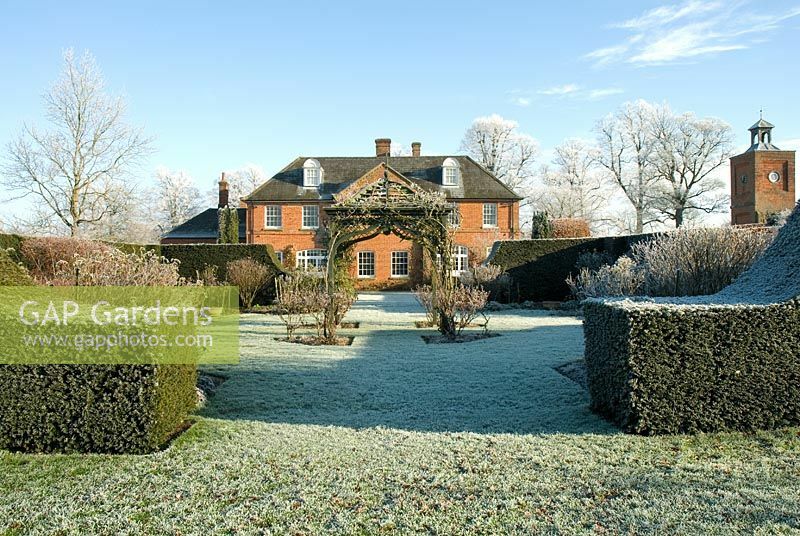 The winter frost in December shows the strong structure of this garden created by the carefully clipped yew hedges and the wooden arbour in the Rose Garden. The Robinsons�have made this impressive garden over the last nineteen years, beginning in 1994.� The rose garden, herbaceous borders�and the crinkle-crankle yew hedges were designed�by Arabella Lennox-Boyd when they first bought the house.� (The�existing house was the stable block to a�very large house that was sadly demolished in the early part of the last century and stood where the crinkle-crankle yew hedge now grows. )� The garden has grown in size over the years to include a moat garden, a spring garden, the lake by the beech wood, the stag garden, the kitchen garden and the summerhouse garden. The Robinsons have been helped during this time by their only gardener Michael Heslop. The sculpture of the mare and foal, made from scrap steel, by the lake is by Harriet Mead, President of The Society of Wildlife Artists.